Hey Hy-Vee shoppers – listen up for a great deal! Torani Syrups and Sauces are available at Hy-Vee in a variety of different flavors. In fact, one flavor can create endless recipes – so your summer drinks can be endless, too. Made with real, simple ingredients, adding just a splash of Torani is a great way to make your own delicious drinks at home. 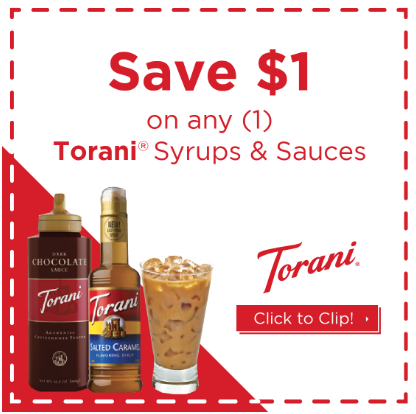 Click here to go to the Hy-Vee coupon gallery and look for the $1 off Torani Syrups and Sauces, while supplies last. Then just clip it directly to your account! It’s that easy. But hurry, this offer will go quick!